Am I the person who never know that I love something after I lose it? Sad to say... Kind of. I like tau sar piah... in fact, any kinds of tau sar piah! In my life, I have came across many kinds of tau sar piah. If you are a Singaporean like me, I'm sure that you will understand my lingo when I refer some of the tau sar piah as the 1) sweet ones, 2) salty ones, 3) yuan yang ones with a combination of sweet, salty and a hint of spicy flavours 4) Penang-style small ball-like mouthful ones, 5) flat with a red print ones, 6) flaky ones and even the 7) 611-like ones. Tau sar piah? 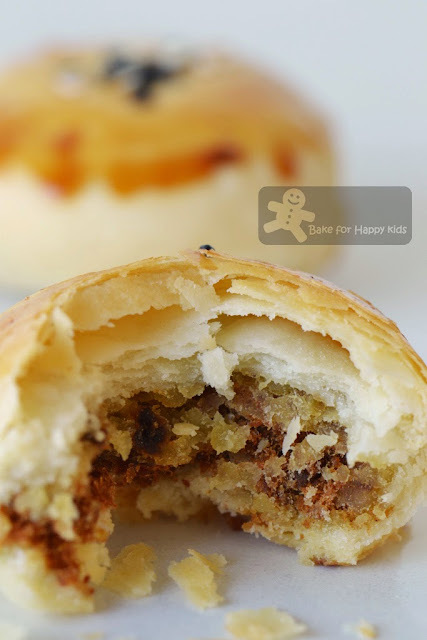 It is a traditional Singapore / Malaysian Chinese type of pastry filled with mung beans filling which can be sweet, salty, pasty or melty. Yuan yang? It translates from the Chinese words 鸳鸯 meaning mandarin ducks where yuan (鴛) and yang (鴦) respectively stand for male and female Mandarin ducks. This Chinese word is sometimes used with an auspicious meaning of lifelong couples. In the case of tau sar piah, it means that it has a perfect combination of sweet and salty flavours! You can find Yuan Yang tau sar piah in Thye Moh Chan or selected Toast Box shops in Singapore. 611? It is a famous tau sar piah shop in Singapore selling tau sau piah for generations but seems to be diminishing from the malls for some reasons. Unlike most tau sar piah, the 611 type of tau sar piah is distinctively melty and buttery. Here I'm starting my tau sar piah baking exploration with this fantastic tau sar piah recipe that I have found at The Yummy Journey and I have transformed this recipe into Yuan Yang kind of tau sar piah which is quite similar to the ones that you can buy at Thye Moh Chan or selected Toast Box shops. First, I have to soak the mung beans in water in the fridge overnight. All traditional tau sar piah (except the vegetarian ones) contain shallots! It is a must as it makes the tau sar piah very fragrant. FYI, most Chinese vegetarians do not eat garlic, onions and shallots... Don't ask me why! Next, I fried the shallots into this deep brown colour. Do not discard the shallot oil as it is required to make the filling subsequently. On the next day, I steamed the beans until they are soft and squashy. 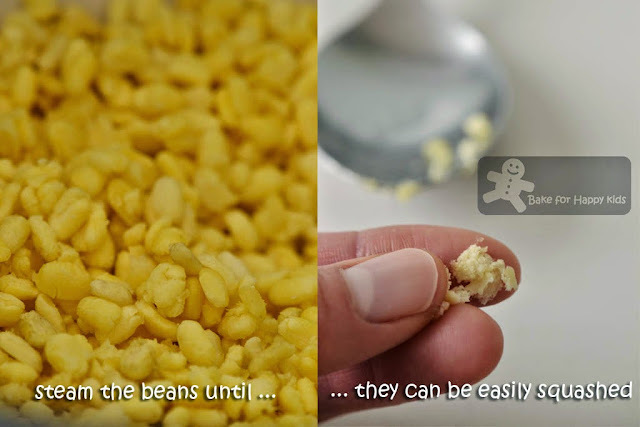 This is how I prepared the mung bean filling. For the yuan yang combination, you need to prepare this meat floss filling. You can use any meat floss that you like and you can buy from any Asian grocery shops. To make the flaky pastry, you need both ghee and butter to make two different kinds of dough. You can either roll the pastry into a ball shape or flatten it slightly. Place the filled pastries onto a lined baking tray with their seam-side down. If you are using the floss filing to fill these pastries, you will have a small amount of leftover filling like this. If you don't, the amount of the filling will be just right to fill 10 pastries. Brush the pastry with egg wash and sprinkle with black and white sesame seeds. Sorry that I don't have a traditional stamp to print red auspicious stamping onto these pastries. After baking... You know I'm very happy that I can bake these. These are as good as the ones that I bought Thye Moh Chan or Toast box in Singapore! I had a closer look at a few tau sar piah recipes and saw a lot of similarities and differences. I would say this has been an impressive start for me as I hope to bake different kinds of tau sar piah in the near future... like (1) the flakiest (2) the traditional ball-like mouthful ones and (3) the 611 buttery ones. Here's the recipe that I have mostly adapted from The Yummy Journey with reference of another recipe at the book, Delicious Asian Baked Treats by Oi Lin. 30g sugar - this amount of sweetness is just right for me but it is not sweet when it is enjoyed with the pastry and so I would mind increasing this amount to 40g. 1/4 cup of meat floss that you like. For me, I'm using fish floss because this is the only kind that I can buy from Singapore. 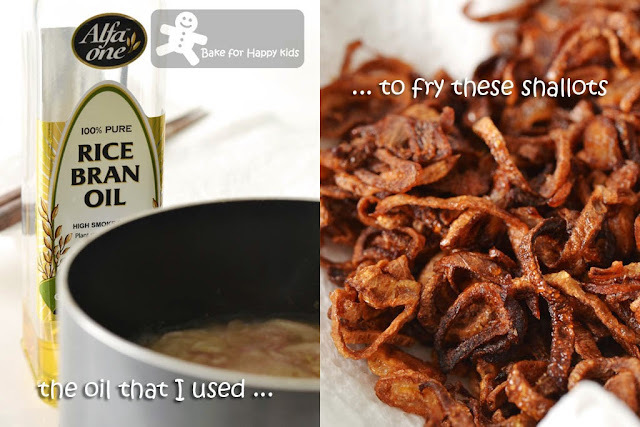 3 tbsp shallot oil, less or more depending on how moist is the floss that you used. Wash and drain the soaked mung beans thoroughly. Using a steamer, steamed at high heat for about 30 mins or until they can be easily squashed by our fingers. Heat a frying pan with adequate amount of oil, deep fry shallot until they are fragrant and crispy with deep golden brown colours. 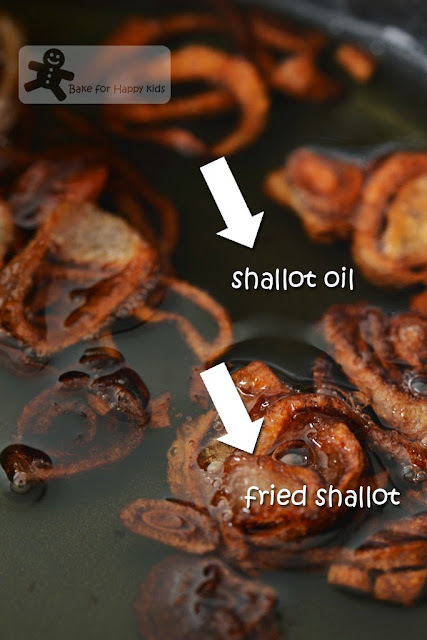 Remove the shallot from the frying oil. 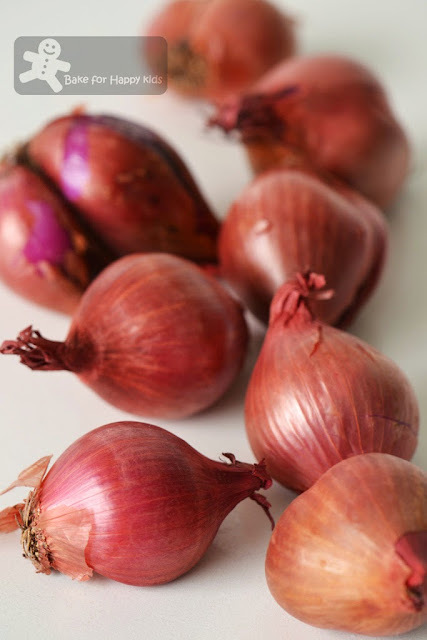 Do not discard the oil and use it subsequently as shallot oil. In a small frying pan or medium saucepan, combine the mung beans, fried shallots, salt, shallot oil and sugar. 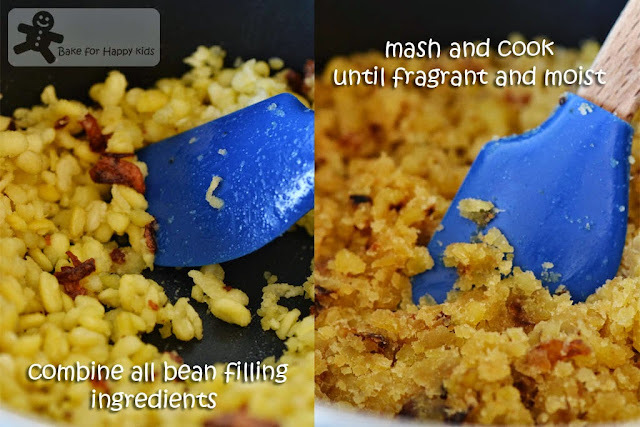 Using a spatula, mash the mixture at the same time cooking it at medium heat until it is moisten and fragrant. Set aside to cool completely. 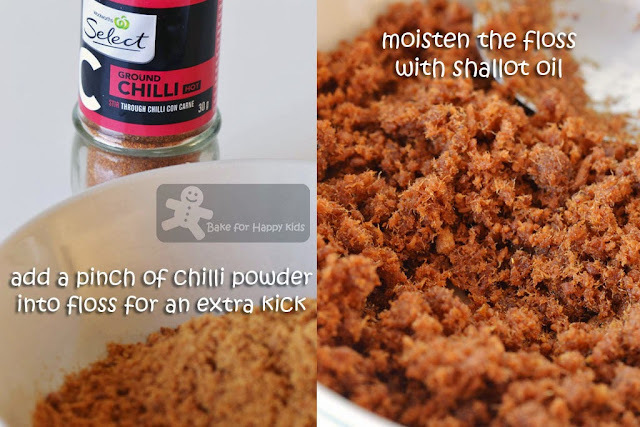 Place floss, chili powder and oil in a bowl. Mix until combined. In a mixing bowl, rub butter into flour. Add water and combine the mixture into a dough. Transfer the dough onto a non-stick surface and knead until it is smooth. Cover the dough with a cling wrap and set aside to rest for 1 hr in room temperature. 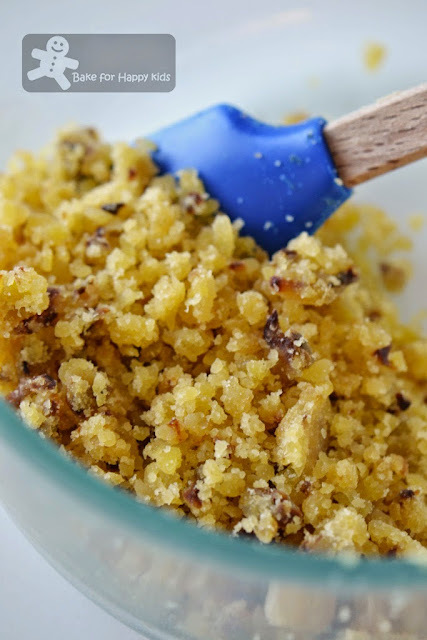 In a mixing bowl, combine cake flour and ghee to form a pliable dough. Cover it with a cling wrap. Set aside. 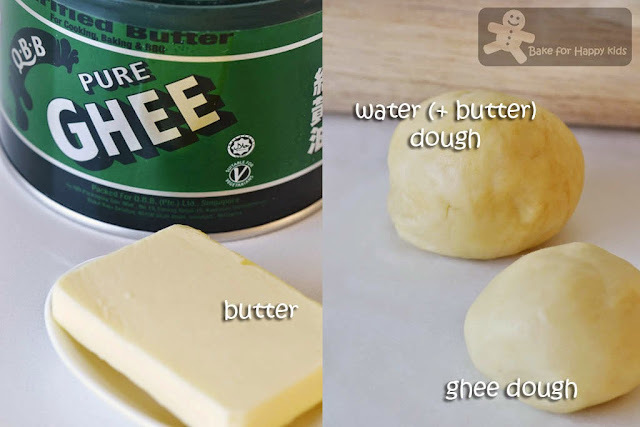 Divide the water and ghee dough into 10 equal portions. 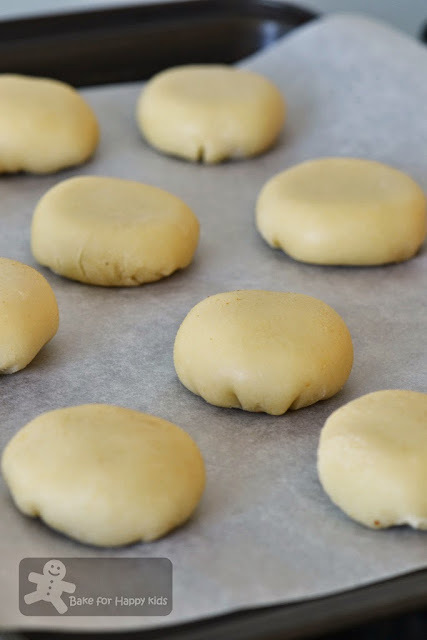 Take a portion of water dough and roll it into a flat round shape. 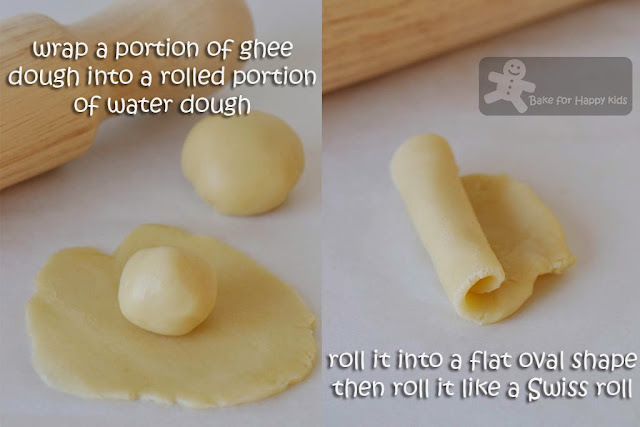 Place a portion of ghee dough on the rolled water dough and wrap the water dough around the ghee dough. Seal the edges. Using a rolling pin, roll the combined dough into a flat oval shape and roll it up like Swiss roll. 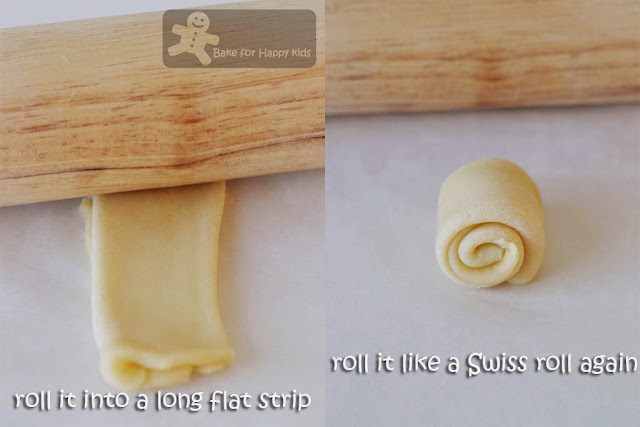 Using a rolling pin, roll the combined dough into a long strip and roll up like a Swiss roll again. 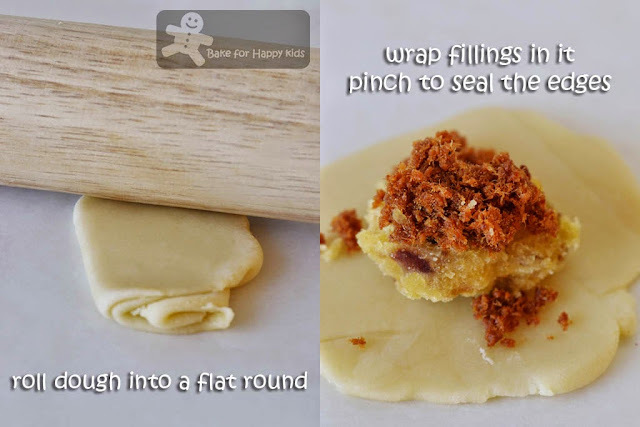 Using a rolling pin, roll the dough into a flat round disc. 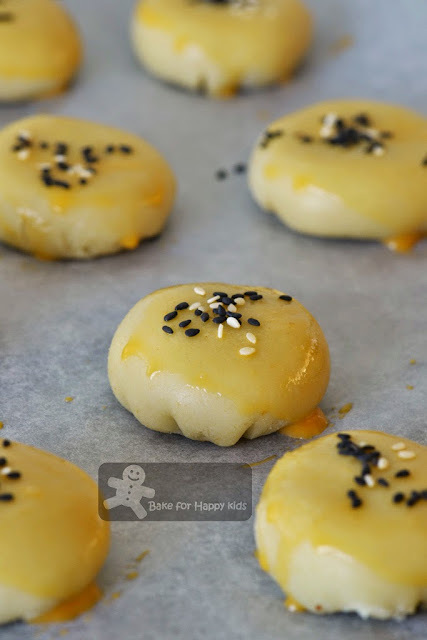 Place 1 tablespoonful of mung bean fillings plus 1 tsp of floss filling in the center of the dough. Wrap it and seal the edges. You can either shape the pastry into a rounded ball or use a rolling pin to flatten it slightly to form a flat disc. Repeat this shaping method with the rest of the pastry and filling. 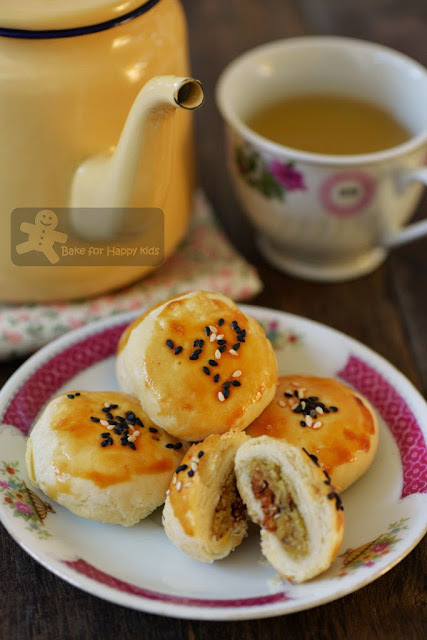 Note: You will have 1/4 cup of mung bean fillings if you are filling the pastry with floss filling. Preheat the oven to 190°C. Line baking tray with baking paper. Place the wrapped pastries with its seam side down onto the prepared tray. 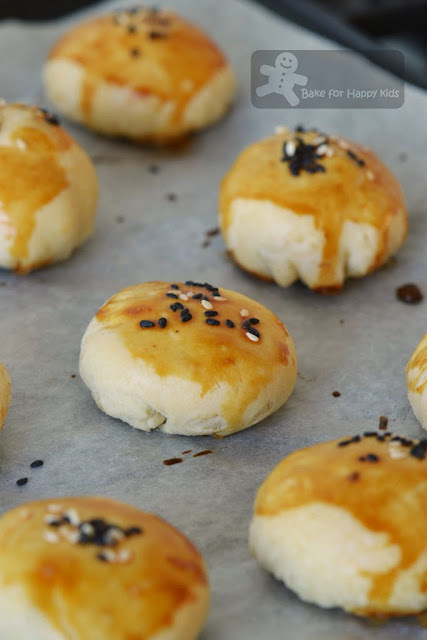 Apply egg wash and sprinkle sesame seeds on the pastries and bake for 20 mins or until deep golden brown. Allow the pastry to cool slightly (about 10 mins) in the tray. Transfer the pastry to a wire rack to cool completely. Store in room temperature for up to 3 days. Best to enjoy these with warm Chinese tea. I think everyone is the same.. When you have the thing, you won't appreciate it.. After you lose it, you'll miss it, haha.. When I see tau sar piah, I think of Penang's famous Dragonball or Kim Heang's biscuits already.. When the salespersons here go there for sales visit, I always tumpang ask them to buy a pack for me.. I can eat 20 pcs at 1 sitting! Really! Wa! Looks really yummy! I couldn't agree much! Have been in Melbourne for 3 months now, I am starting to miss the food in Singapore! 香味肉干 sells those round tau sar piah which are quite yummy too. I like to eat it as a whole. These look really yum, Zoe. I appreciate traditional food, but tend to only eat or buy more if I'm on a road trip. It seems more enjoyable when I'm on a journey to somewhere..lol! Zoe, you are fantastic! You baked tau sar piah! I'm sorry I am not a tau sar piah fan. Ooops! Maybe if I live away from Malaysia then I will miss it hah..hah... Everyone who goes to Penang will sure come back with boxes of tau sar piah. I won't be surprised to see another post where you do research and experiment and analyze the different recipes to share with us! Aren't we all the same? We only missed them when we can't have them easily. Your tau sar piah sure tastier than the commercial ones. With all the ingredients you put in the filling, I sure would love to try some of yours! Omg, yes these are amazing! My favorite ate the malaysian ones too, penang style, I happily eat those! I much prefer them bite sized! You're so talented making these from scratch! I'm glad you're able to enjoy our traditional snacks and pastries since you're making them at home! What a great looking dish! One that's new to me, and I definitely need to get acquainted. Really nice -- thanks so much. I also like tau sar piah. Can i use my char siu to exchange some ? hehe..
Hi Zoe, tau sar piah is my favourite. My hubby travels to Penang quite frequent. He'll never forget to bring back a box of tau sar piah and I can finish it all by myself. Hi Zoe, Actually wanted to know whether this tau sar piah is considered a dim sum or not? According to wikipedia all the 酥饼 is consider dim sum lol! Glad that you tried it, hope you enjoy these tau sar piah! I think most of us don't know what we've got till it's gone.